Kareem Abdul-Jabbar reveals the secret to the shot that made him the highest scoring player in NBA history, and the passion for education that set him up for life after basketball. (CNN) - Imagine facing Kareem Abdul Jabbar at the plate. Baseball, he tells us in this CNN Profile, was his first love. As an unusually tall boy, he was a force on the mound. His fast ball was FAST. Plenty of force. Not enough finesse. Who knew? Kareem Abdul Jabbar is full of surprises. 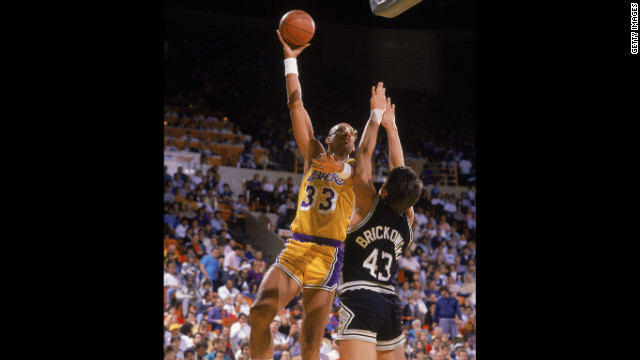 For basketball fans, Jabbar explains here in the clearest way I've ever heard, what made his signature shot – the sky hook – virtually unstoppable. It wasn't his 7-foot-2-inch frame - although of course that was part of it. It wasn't the flick of his wrist at the top of his arch or the way the ball rolled off his fingertips - although those were key ingredients too. If you go to YouTube and study the sky hook highlite reels - watch closely what happens between the time Abdul-Jabbar gets the ball and the time he releases it. That's where you'll find the clue to the essence of his scoring prowess. He describes it for us on this CNN Profile in a way that can benefit all players, no matter how young or how short. But our conversation, which you can listen to by hitting the play icon above, did not dwell on basketball. Abdul-Jabbar has too much on his mind to confine him that way. In the 23 years since he retired from the NBA at the age of 42, he has been driven by his curiosity, his post basketball writing career, his passion for history, his love of Jazz passed down by his Julliard educated father, his battle with a rare form of blood cancer which he seems to handle with his characteristically unflappable demeanor, and his mission to spread the gospel of science education to under-served minorities. Jabbar, a relatively guarded man in public, also reveals what he, as a divorced father, has tried to impart to his five children. And he explains here why he considers himself a romantic. When you hear how he defines that, you may conclude that being a romantic helped him score more points than anyone else in the history of basketball.